I think it was 4 years ago when I got hooked on cold tofu somen noodles. It is not a traditional Japanese dish but a product that was probably dreamed up by a company a few years ago and I guess has quite a bit of a fan base since grocery stores still sell it. 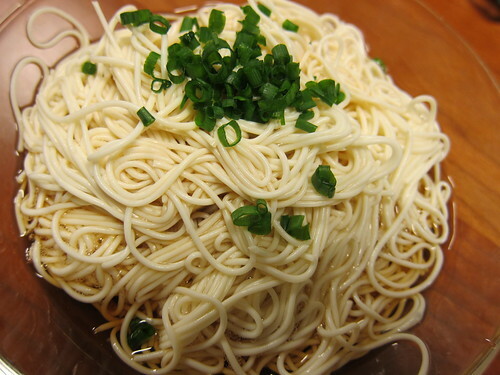 Since normal cold somen noodles are a summer dish, these somen noodles made out of tofu also usually come out right before we hit the summer season. I use to eat it like a maniac because I loved both tofu and somen so this product seemed like a dream come true. Plus it was low in calories and I was trying to lose pounds and pounds of weight back then so this was perfect and it sure did work. So now it is right before summer and the tofu somen are displayed nicely on the grocery store shelves. I was reminded of my love for this product and decided to give it another shot. I ate it with green onions, grated ginger, and broth with your basic Japanese ingredients like dashi, soy, and mirin like I would normally eat cold somen noodles. It tasted fine but something felt wrong. It took me a bit to realize this but I think I’ve started to like the flavor of soy in real tofu so much that not being able to taste the soy enough in the tofu somen just didn’t seem right. So it wasn’t like the tofu somen noodles tasted bad but I think I just had to consider this product more of a new type of somen that happened to be made with tofu than a tofu product. So I guess my taste buds have changed but I still think tofu somen noodles are a good healthy midnight snack. Much better than the homemade Oreo cheesecake leftovers (or may I say calorie overload?) I ate the other day! Yum but yikes! Alisa Sanada, (@asanada) co-organizer for Nagomi Kitchen, is a former Texan currently residing in Kawasaki. She went from craving fresh jalapenos while working 7 years in the web industry in Tokyo and Osaka to craving fresh tofu while traveling across the globe for a year in 2011 as a full time nomad. Alisa joined Nagomi Kitchen wanting to bring together her passions, the web, travel, and food. When I eat my standard Japanese steamed rice at home I usually have my jurokkokumai (十六穀米) which means rice with 16 grains. I have a huge stock of small packets with these 16 grain mixes I get from the supermarket. These individual packets have a long list of grains including foxtail millet, germinated brown rice, black rice, black soybean, amaranthus, sorghum, quinoa, azuki bean, black sesame, white sesame, adlay, red rice, proso millet, barley, corn, and Japanese barnyard millet, and I mixed them into my white rice. Apparently the grains have lots of fiber and is very good for you but I honestly just like it because it tastes good. However, there are days when I do a little something different. Today my husband felt like takikomi gohan so I made this dashi and soy sauce based rice dish in my rice cooker. All I needed to do was make the base flavor for the rice with soy sauce, mirin (sweet rice wine), dashi stock, and salt, and today’s ingredients happen to be chicken thighs, aburaage (deep fried tofu), carrots, shimeji mushrooms, and gobo (burdock) which I cut up into small pieces and placed over the rice to cook. 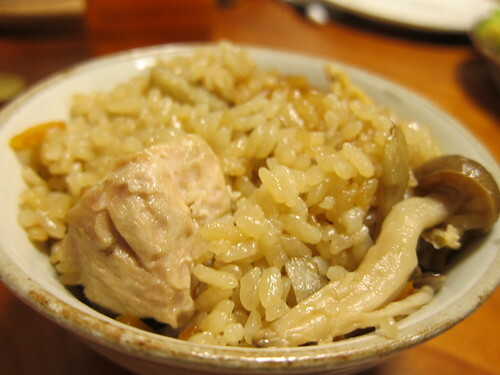 If you look around for takikomi gohan recipes on the internet, there are ones that use other types of mushrooms, use konnyaku, hijiki sea vegetables, among other ingredients but today I felt like having chicken thighs, aburaage, and gobo for sure so the above was just what I used. I normally like hijiki but if you buy good hijiki the flavor is quite strong so on a day when I wanted to really taste the chicken I decided not to put it in. I also see a few recipes that use sugar or some other sweetener but I usually like a more subtle sweetness so I replaced it with mirin. Lastly it was already past 8PM when I started cooking so I chose a shortcut and used granulated instant dashi instead of making homemade dashi. When you make this dish, make sure you can find gobo where you live because the earthy taste that comes from this root is very distinct yet nice. Plus preparing it is fun since you use the sasagaki cutting style which literally means to cut something as fine as a bamboo leaf but basically you are cutting the burdock like you are sharpening a pencil with a knife. You can also find instructions on the internet on how to do this so give it a try! 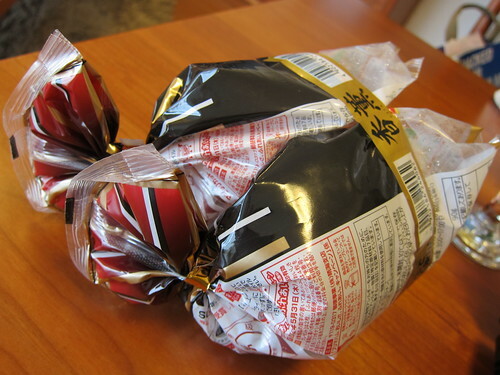 I never understood why sausages in Japan are often packaged in 2 separate inflated bags. The really cheap sausages are most of the time just stuffed in one bag probably to keep costs down and the fancier kind which are usually larger or have herbs or other flavorings inside are in vacuum packs. However, for some very odd reason the ones the general consumer usually buys are in 2 bags that are always taped together and sold as a set. 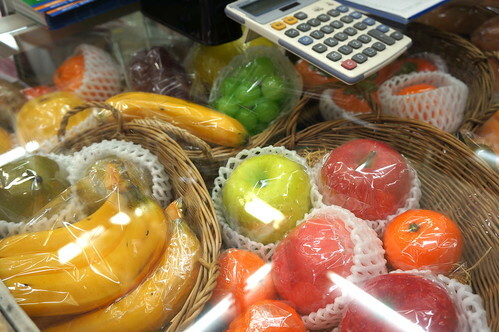 Japan is often criticized for its excessive packaging like for their overpriced fruits, but these inflated bags, not only are these balloons a bit annoying when you are trying to place them in your fridge, but the packaging just made no sense. So I did some research and found out that the bags are inflated because they are filled with nitrogen to prevent food spoilage. The fact that they are in separate bags then allows for double protection against oxygen because most consumers don’t use all the sausages at once. Apparently these bags of nitrogen are slightly better for keeping the juiciness of the meat than the vacuum packs. However, this sort of packaging is probably only possible because the sausages that the average Japanese person eats are small and a bunch can actually fit in a small inflated bag. Now not only does it makes sense that all the other larger sausages are in vacuum packs, but also the vacuum packed ham and bacon since they will lose their shape if they were placed in these inflated bags. So I suppose this solves my silly riddle but not the slight headache of having to deal with these balloon like packaging in my fridge? If you like cooking like me, I think you MUST visit Kappa-bashi（合羽橋）during your stay in Tokyo. 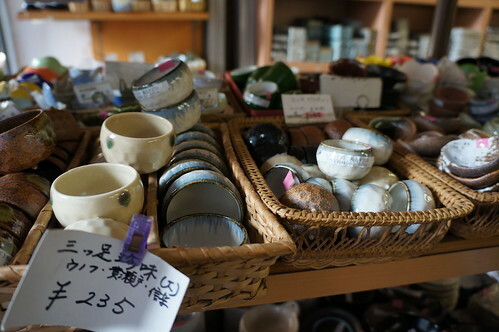 Kappa-bashi is the street and there are so many shops which provides cooking and kitchen tools such as plates, paper thing, pot, knives, cookie templates, chopstics and so on, I love this place verymuch! 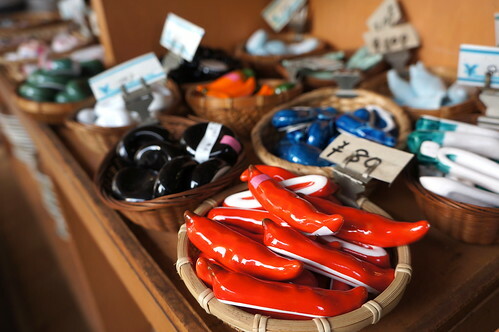 But few weeks ago, my boyfriend’s mother and aunt visited us from Denmark and we took them to Kappa-bashi so finally now I can introduce you my favorite place with many pics! 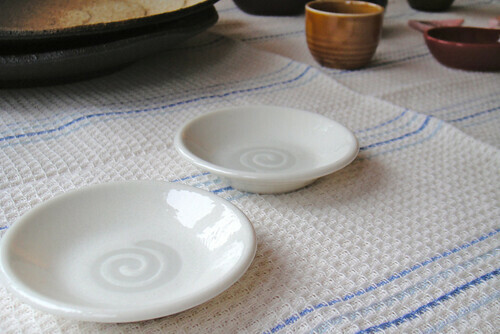 Many kind of design of tiny plates, it called “Mamezara” in Japanese. 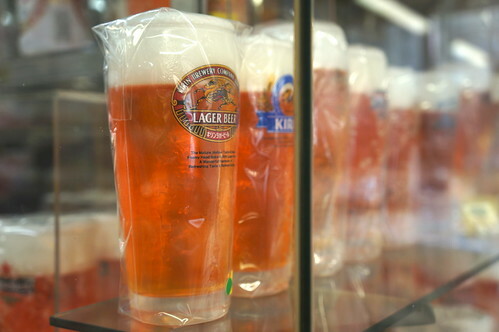 The price is just around 100-300 yen. 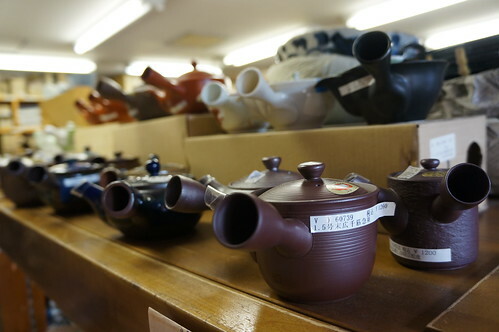 Tea pot, price is about 1,000 yen. You can find many kind of green tea easily at the supermarket and just put them into this pot with hot water. 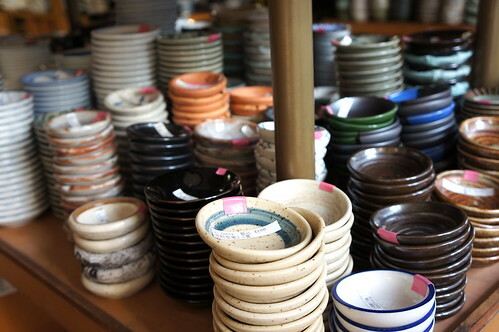 Cups, price from 500 yen to 1,000 yen. 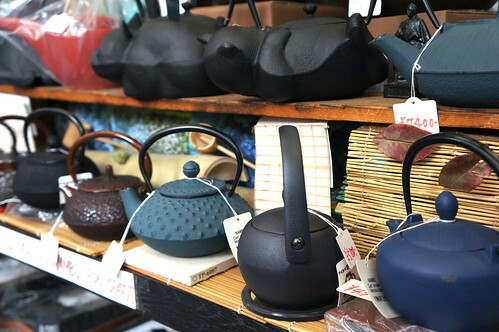 Nambu Ironware, it’s the Japanese traditional craft. Looks nice! If you visit Takayama during your trip in Japan, maybe you can find this one at there when you served original dish at Takayama, “Hooba-Miso”. 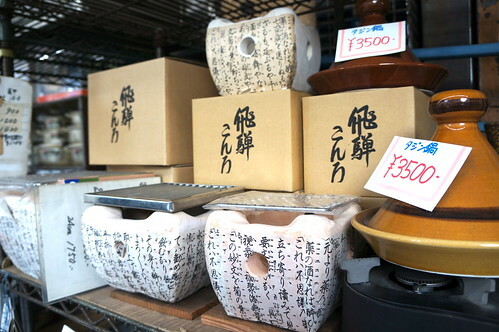 Kappa-bashi is also famous for the food sample. Kappa-bashi is nearby Asakusa (about 10 minutes on foot) so you can schedule to visit this wonderful place at the same day as Asakusa. 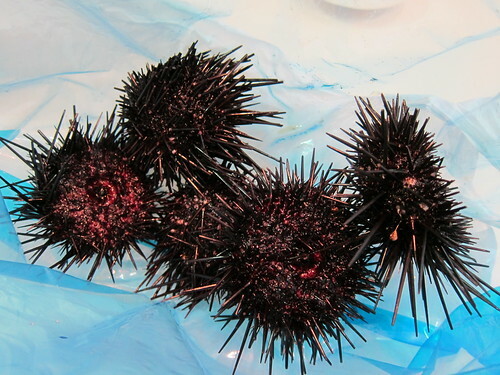 A few weeks ago some nice folks gave me fresh uni or sea urchin since they just came from the Tsukiji fish market. This was definitely a very lovely gesture but also very unexpected. 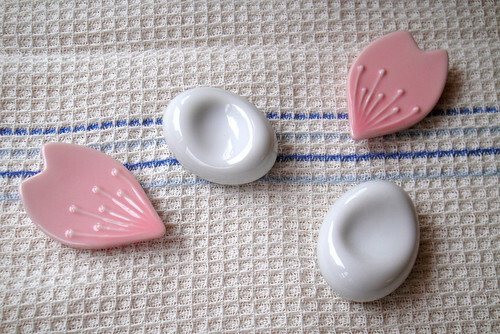 Because honestly, the only time I actually cut an uni open was when I found a bunch somewhere in the beaches of Mexico I think. 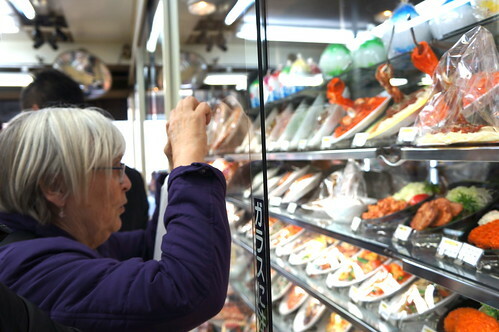 Since coming to Japan I’ve been spoiled with the affordable fresh but already prepared uni in the stores so I just never had to go through the whole preparation process. It would have been great to slice these suckers open on the spot and offer them a piece too but I seriously was not ready. When I was finally ready for the challenge, I was too excited to wait for any of my kitchen savvy friends to respond to my dilemma that I decided to rely on YouTube. My husband and I have actually learned a lot through YouTube. It has saved us from having to pay someone to install our built-in electric cooktop because a video tutorial showed us how to do it ourselves among other things so I thought it was the perfect solution. Sure enough there were a bunch of Japanese (and English which I found afterwards) videos on how to properly scoop out the uni. Most of the videos tell similar instructions where you either use a knife or some other tool that will help crack open the uni and then you are to pull out the black seaweed that is covering the lovely orange jewels. But the one video I found later on said that you could actually eat that black seaweed separately so will have to try that next time. So the lesson for today is, be like me and use YouTube to solve all your problems! Or at least all your Japanese food related problems because it’s sometimes easier to understand than written recipes. And yes of course, if it weren’t for the lovely folks that gave me these uni in the first place, I wouldn’t have had this yummy experience. Arigato very much and next time, I will be prepared for sure! When you look at the Nagomi Kitchen site you might only see the two of us, Megumi Kusunoki and myself, Alisa Sanada, on the about us page, but we are actually supported by many amazing advisors. Among these wonderful advisors is Megumi Kusunoki’s mother Masako or “Margaret” which is what her lovely daughters call her as somewhat of a joke. If you are a past participant in one of our cooking programs, then you might have met her. She’s the one with the camera snapping away making you feel like a superstar during our sessions. And if you are going to be participating in the near future, make sure to get all your Japanese food and Bali scuba diving questions ready because she sure knows a lot about both and is ready to share. She is from Yamanashi Prefecture, most famous for Mount Fuji. 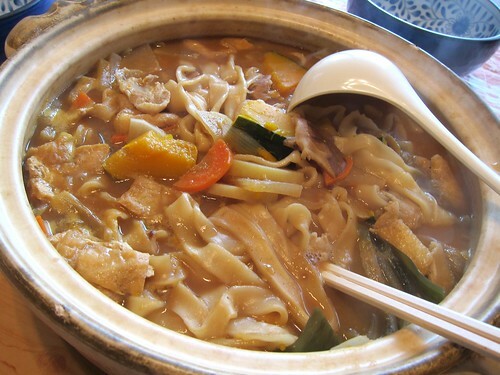 However, in my eyes it’s the land of the yummy regional dish houtou. It’s a flat udon noodle dish with vegetables in a miso soup broth that is normally eaten at a restaurant if you are not from the region. But of course the locals eat it at their homes and mmm-hmm it sure is delicious! I had the pleasure to try her homemade houtou, which was my first one outside of a restaurant. What I liked about it most was the fact that we were eating it nabe hot pot style instead of each person with an individual bowl. It was great seeing the soup get thicker and thicker because you cook the noodles still covered with flour unlike other noodle dishes where you need to pre-cook using another pot. That combined with the broth that comes from the ingredients like chicken, kabocha pumpkin, onions, fried tofu, carrots, mushrooms, daikon radish and of course miso, mmm-hmm is all I can keep on saying! Even if you can’t get a hold of houtou noodles, at least try making it with udon noodles. You will understand how great miso is, and how it is not just for miso soup! 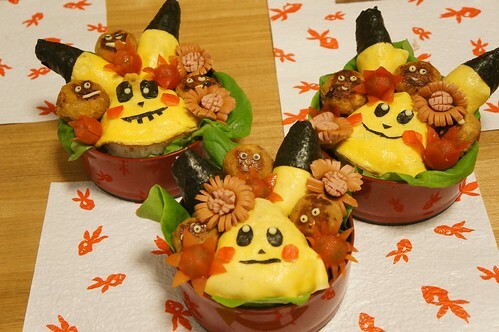 3 guests joined our Kyaraben lesson yesterday and made a Picachu bento box. But now, Olivia, Dylan and Rex became a Kyaraben master so they don’t have to go to Kyaraben restaurant! Thank you Olivia, Dylan and Rex! 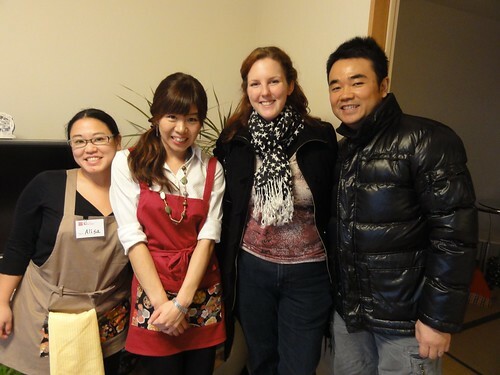 Last Sunday we had a past participant from our kyaraben class from December come back for our Japanese basic cooking class. What was great was that her Japanese husband came with her to participate in the program this time! Like our other expat participants, she told us that it’s the basic things that are part of a person’s daily routine like grocery shopping or cooking that are some of the most difficult obstacles to overcome when you first settle into a new country. Having personally experienced trying to cook in various countries where I could not speak nor read the language, I can understand how it is difficult to adjust. During the lesson it was great to see her pause and reconfirm from time to time to make sure she was understanding and remembering everything. Before I started Nagomi Kitchen cooking lesson, I was thinking a lot about the lesson menus. And when I was considering it, I believed that making kyaraben will be a one of fun thing for almost participant because I have enjoyed by myself very much. 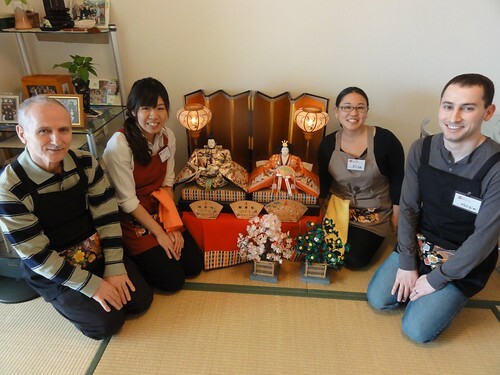 And few days ago, I received a request from guest who booked our kyaraben lesson for end of this month. Actually it was first time for me to receive this kind of request, (in addition I have never seen this character before!) but I tried to make it. 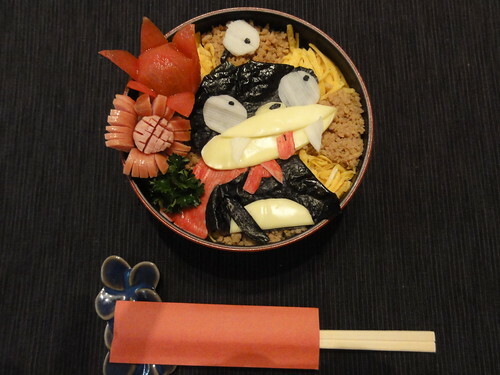 How do you think about this Nibbler kyaraben? I love try to make new kyaraben, so if you want to make your favorite character with us, please let me know when you booking. 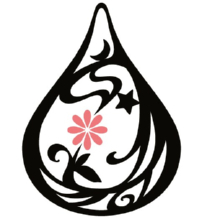 Of course I want to try but I guess there is some character which is completely impposible to create as kyaraben so I will inform you if I can do that or not after receiving a request! Nagomi Kitchen is expat friendly too! 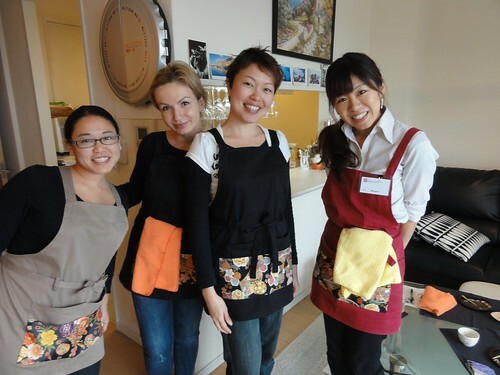 Last Wednesday we had two very friendly expats from Poland and Malaysia participate in our cooking program. Right now most of the Nagomi Kitchen program participants are travelers visiting Japan so not only was it great to see that we are attracting a wider audience but it was fantastic for personal reasons since they reminded me of when I first started living in Japan. When I first started living in Japan, although I know I had an upper hand compared to others since my cultural upbringing was Japanese, I still had a lot to learn to navigate through the supermarkets in Japan. 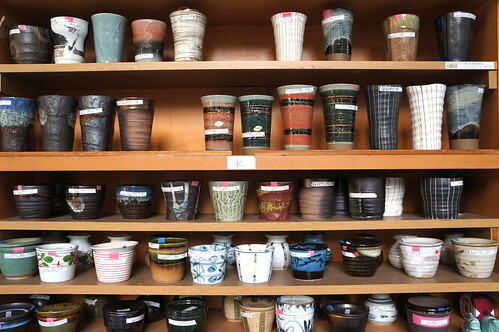 Even simple tasks like choosing the right miso was very difficult at first. Where I grew up in the States, there were only a couple of brands to choose from so seeing all the options of white, red, and mixed miso was quite overwhelming. Watching lots of cooking shows, searching the Internet, flipping through food magazines, and attending classes that taught me the basics of dashi soup stock, soy sauce, sake, Japanese vegetables and many other topics were what helped me in the kitchen. When one of our cooking program participants asked about all the basic mushrooms that are sold in Japanese supermarkets and how it was difficult to figure out which one was a shitake mushroom, I could very much understand her struggle. Since I ate shitake, enoki, and nameko mushrooms when I was growing up in Texas, I could at least distinguish those three at the supermarket. But the others like the eringi king trumpet mushroom, the maitake Hen-of-the-Woods mushroom, the buna shimeji brown beech mushroom, and the bunapi shimeji white beech mushrooms, I learned about while living in Japan. 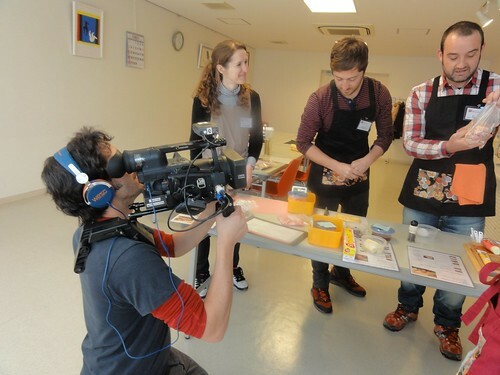 I also noticed that the Nagomi Kitchen cooking program helps expats to learn the Japanese words and packaging of familiar ingredients like sesame oil or potato starch. A lot of them struggle trying to find the ingredients they need to make food from back home so by the end of the lesson they know what to look for and also know how to use those same ingredients to make at least one or two Japanese dishes. So my hope for the Nagomi Kitchen program is to not only be a program for those visiting Japan to get exposed to Japanese food, but to support new expats in Japan so they can get a head start and become more comfortable in their new kitchen. 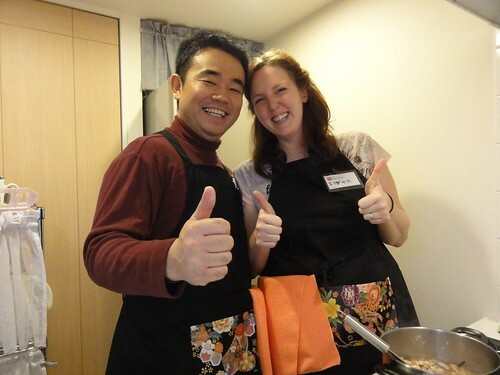 We’ve actually had a few people in the past participate in our program because it was given to them as a gift from friends or family so maybe the Nagomi Kitchen cooking lesson might be a good gift idea to welcome fellow expats to their new life in Japan? When it comes to the topic of Japanese food with travelers, I know everyone loves to talk about the fermented soybean dish natto, since it is the quintessential weird food of Japan with it’s gooeyness and smelliness. 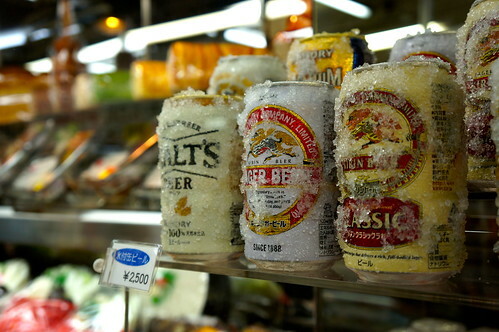 But I am honestly tired of hearing Japanese people always asking non-Japanese travelers if they have tried natto during their travels in Japan and if they liked it or not. I mean doesn’t every Japanese person already know that even some Japanese people born and raised in Japan can dislike natto? And I get more annoyed when people go bonkers with disbelief when the traveler actually does like it. Seriously, I wish people would come up with other things to ask like have you tried shirako fish milt, because although it might sound disgusting it sure is terrific! Well, that said, I never was much of a fan of natto while growing up as a Japanese-American in Texas. Although I still don’t go out of my way to buy natto at my local supermarket in Tokyo, that doesn’t mean I haven’t grown to like it. When I first tried good natto, it was when my Japanese aunt introduced me to natto made in Ibaraki prefecture. I’m still no expert at this point when it comes to natto specifics, but I could really tell the difference because the flavors from the soybean itself was stronger than the pungent smell you often hear about making the natto quite pleasant to eat. The way you eat the natto might also change your perspective. Depending on how much more sliminess you can embrace, you can mix and match raw egg, yamaimo mountain yam, okra, green onions, cucumbers, dried seaweed, shiso leaves or even kimchi and cheese. Natto maki rolls are very common but you can also find natto omelets, tempura, and even pasta. So for those who have already given up on natto on your first try, it might just be that you haven’t found your best match. There are so many different kinds of natto from different regions, brands, and well even the size of the natto will affect the taste. 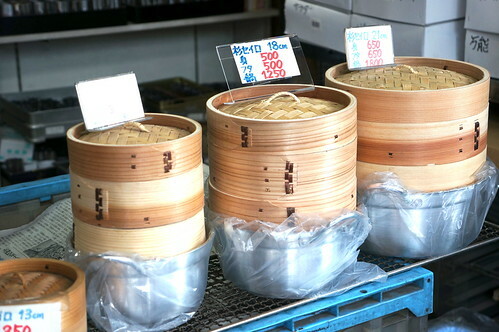 Your local supermarket might have a good selection but make sure to check out a nearby depachika (the basemet floor of a large department store) or other specialty food stores you may stumble upon while you wonder the streets of Japan. Hopefully you will finally find your best match. 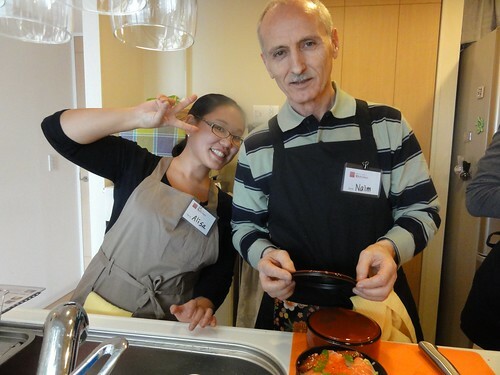 This Thursday we had a lovely guest from the US and his father participate in our Basic Japanese Cooking lesson. They were such fun and enthusiastic guests that I, myself, very much enjoyed my time with them. Today I made a Japanese style soup with bacon for dinner. 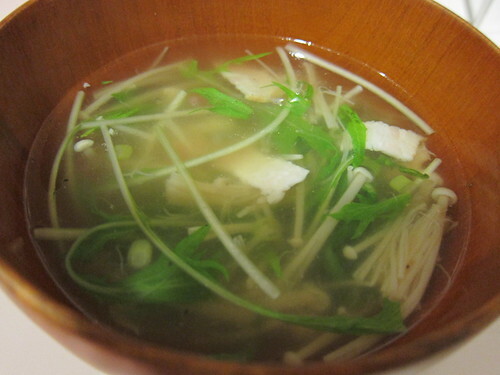 I suppose if I still were in the States I might have made the soup with potatoes, cheese, leeks, or beans but this time since I am in Japan using Japanese bacon, the soup had a light chicken broth base with mizuna, enoki mushrooms, and green onions. I suppose everyone has their opinion of Japanese bacon depending on where they come from. Coming from the States you might be surprised at how it tastes more like ham. But as long as you know how to cook with it, I’m hoping you will crave more of these new set of flavors rather than just longing for whatever is back home. Using bacon with ingredients like asparagus, spinach, potatoes, and cheese is quite common in Japan but I love it when I find bacon recipes that really have an obvious Japanese twist to it like bacon and nanohana blossoms pasta. You can either make a simple version with just basic flavors like olive oil, garlic, red pepper, and of course salt and pepper, but a cream sauce would work well too. 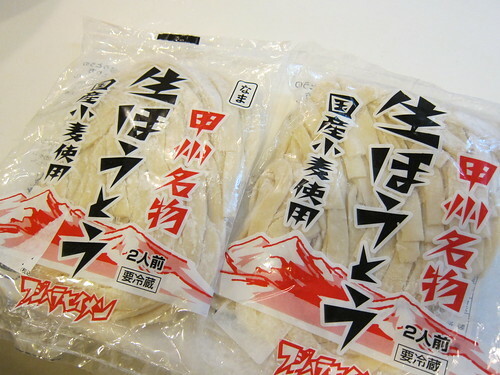 Add any sort of Japanese mushroom you find at the supermarket that day that is cheap like maitake mushrooms and voila! I honestly cannot imagine my Japanese mother making this dish at home since it definitely is the younger generation that has incorporated this new ingredient into their diet for better or for worse. 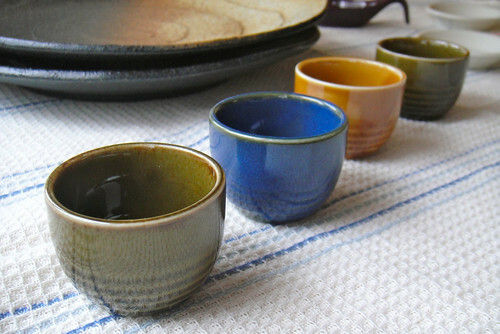 However, it is not uncommon for quick and easy East meets West types of dishes like these to appear in a modern Japanese home cooked meal. 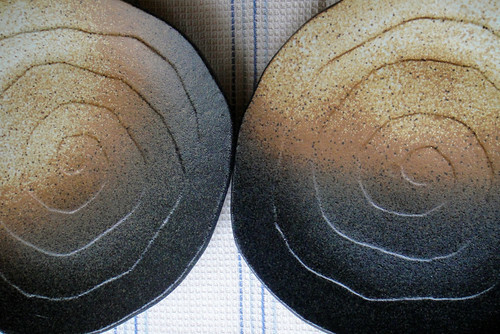 So although it is definitely good to learn about purely Japanese ingredients, sometimes it is fun to learn how these perhaps more familiar ingredients are used in Japanese home cooked meals. Make sure to ask us about seasonal vegetables like nanohana during our Nagomi Kitchen cooking lessons because spring is coming to Japan and it’s definitely an exciting time for food here! 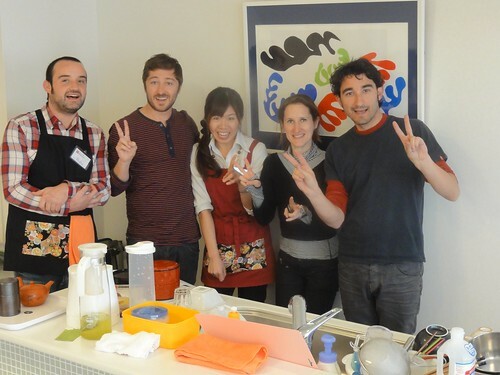 Today we held ” Learn basic Japanese cooking lesson ” with four guests.